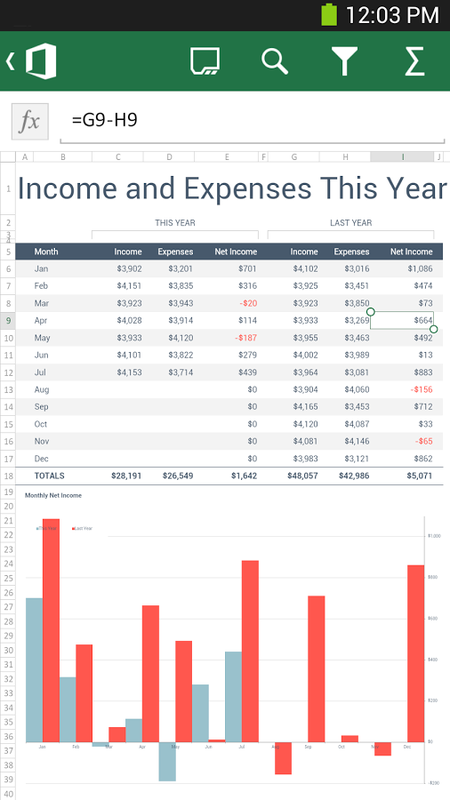 • Great-Looking Documents - Word, Excel and PowerPoint documents look great on your phone, thanks to support for charts, animations, SmartArt Graphics, and shapes. • Optimized for phone - Word, Excel and PowerPoint have been optimized for the small screen of your phone. • Resume Reading - When opening a Word document from OneDrive or OneDrive for Business on your phone, it automatically resumes at the place where you left off reading, even if you last viewed the document on your PC or tablet. • Presentation Views - The Slide Navigator view in PowerPoint lets you browse slides faster, while speaker notes help you practice your presentation. • Documents Remain Intact - Formatting and content remain intact when you edit Word, Excel, or PowerPoint documents on your phone. • Comments - You can review comments that have been made in Word and Excel documents on your phone and add your own comments. * Sign in with a free Microsoft account to create, edit and save documents for home use. A qualifying Office 365 subscription is required to create, edit and save documents for business use. Qualifying plans include: Office 365 Small Business Premium, Office 365 Midsize Business, Office 365 Enterprise E3 and E4 (Enterprise and Government), Office 365 Education A3 and A4, and Office 365 ProPlus. Requires a phone running Android OS 4.0 or later.